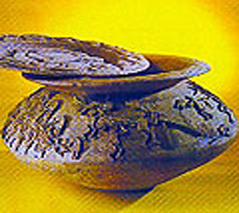 A dome shaped lid held on stem like base is a common brass article to be found in every Assamese household. The Hajo’s in the Kamrup district, the Baniakuchi in Barpeta district and the Sarthebari are engaged in the art of metal casting. The metal utensils are used during the marriage ceremonies and to hold religious offerings. The betel nut and leaves, the economically and culturally significant crop of the region is also placed in the metal utensils and offered to guests when they enter the house. Sarai– a common ceremonial vessel is made in various different pieces which are assembled by either brazing or pressing the sheet over mould. The other utensils include water pots, bowls, and dishes with stand. The process of shaping and beating the metal is usually followed by embossing and cut work follows. Another interesting feature of the Assamese surai is that it is always sold by the size of its diameter instead of its weight.